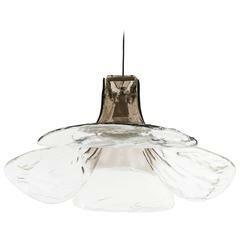 Four curved and tapered glass “petals” with a violet tint, held in a chrome fitting, and suspended from a cord. Mazzega model LS 185. Overall height is flexible. Body height is 15". This fixture is non-UL wired for the US. If you require UL, we must send it out to a local electrician for an extra fee. Please advise before checking out if this will be necessary. A cluster of ball-shaped glasses suspended from numerous steel chains held by a radiating structure on the top. Open-dish version of Torlasco’s famous spherical version which he created for Lumi. 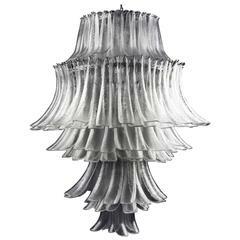 This chandelier from the 1970s was designed by Carlo Nason for Mazzega.